Odisha Joint Entrance Examination Board (OJEEB) released the OJEE Second Round seat allotment result today on 14th july . All the hopefuls who have come across Odisha Joint Entrance Examination (OJEE) and have qualified in the test can check the OJEE 2nd round temporary seat allotment result on its official website, ojee.nic.in. The OJEEB has completed with the online registration choice filling process from 5to 11th july. Candidates qualified the OJEE have registered and filled their choices during the announced dates. Candidates can now check OJEE 2nd round seat allotment list and can check whether they have allotted admission or not. Candidates who got allotted admission in mock seat allotment can lock the choices and proceed to finish the registration on 26th or 27th June. Candidates who got confirmed the admission will be listed in OJEE second round allotment list, which is going to be displayed on 14th July. Candidates who do not get the admission in 1st round can proceed with the 2nd round seat allotment process, document verification, fee payment and other proceedings. Candidates can get the clear-cut information regarding the OJEE mock seat allotment, first, second rounds of seat allotment and other details from the following. Odisha Joint Entrance Examination Board annually conducted the OJEE written test for aspirants seeking admission into BE, B.Tech, and other courses. For the 2018–2019 academic year, the Committee will conduct the Odisha Joint Entrance Examination (OJEE) for admission to Undergraduate Courses in (Lateral Entry) Engineering & Technology, Postgraduate course like MBA, MCA, Pharmacy, (Lateral Entry) MCA, MPLAN, MTECH, MARCH, MPHARM, and Int. MBA in Universities, Govt. Colleges and Self-Financed Institutes in the State. The OJEEB has conducted the written test on 13th May for lakhs of aspirants seeking admissions in UG/PG courses in the state of Odisha. The OJEE board has now announced the mock seat allotment results for the qualified aspirants. Also, the OJEEB has rolled out the OJEE Seat allotment, counseling, document verification and the complete schedule. Candidates can once go through the following article to check more details of OJEE mock allotment result and other details. Candidates who have qualified the OJEE 2018-19 can check the OJEE 1st round seat allotment result from today 2nd july onwards. Candidates can check the downloading process, choice filling dates from the following. How to check OJEE Second round seat allotment results Online? 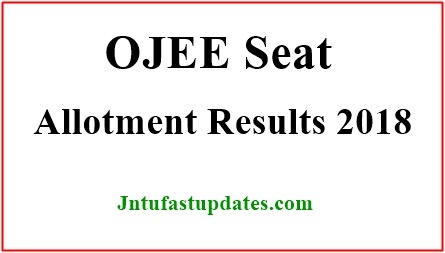 OJEE Seat Allotment result link will be appeared on homepage. The OJEE allotment list (2nd round) will be displayed on the screen. There is no final allotment. How can I know my final allotment? Plz tell me. How can download final allotment letter for MBA(OJEE) on which date ? ?